They’re baaaaack – sort of. The Phillies played their first spring training games of the season, and if you squint, it looks like real baseball! Their first game in Clearwater offered us a look at what the line up to start the season might be. Things can always change due to injury or performance (good or bad), but this is the best bet to be the lineup on opening day. Aside from a couple of new names in the outfield, this lineup will be largely familiar to those of you who watched Phillies games in 2016 (all 29 of you). Let’s stick with what we’re familiar with, and finish out the infield with today’s look ahead at what 2017 has in store for us at the position of catcher. Cameron Rupp entered 2016 as Carlos Ruiz’s back up. As the season wore on, he gradually supplanted fan favorite Chooch as the starter. Rupp’s play was far too good for him to be riding the pine. It didn’t start that way – through June 14, he only had a .719 OPS (13th out of 34 catchers with at least 100 PA to that point). This was still well ahead of Chooch’s .676 (20th out of 34), and with Chooch on his way out, the Phillies had every incentive to let Rupp develop at the big league level. On June 16th, they appeared. 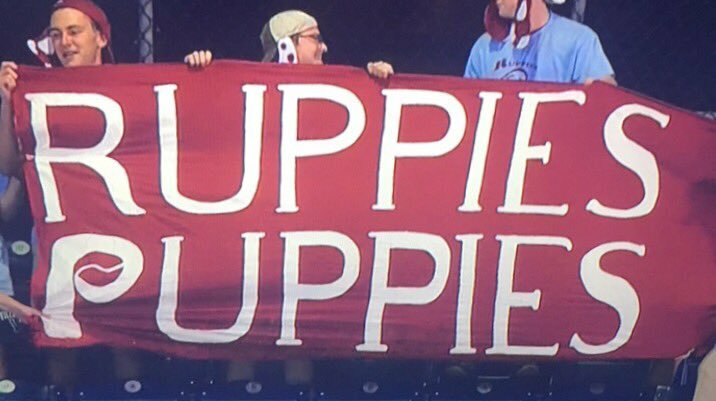 From the day Ruppies Puppies were shown on TV to the day Chooch was traded, Rupp’s OPS improved to .911 (over that time frame, the 3rd best mark by a catcher in all of baseball). I’m not superstitious, but it couldn’t hurt to see these pups on opening day. After Chooch got traded (Fun fact: Chooch played 1,069 games with the Phillies, and the only time he was DH was his final game in red pinstripes), Rupp’s performance faded. 105 games at the major league level represented a career high for Rupp. Given that minor league seasons end earlier than the major league one does, it wouldn’t be surprising fatigue was a factor. A report came out that he was playing through most of last season with an arm injury, but how much that impacted his offense is up for debate. What should we expect in 2017? While his overall offensive performance in 2016 was average, his batted ball profile suggests that he is better than the numbers make him look. I’d expect him to have a good year offensively, although the world beater we saw during those dog days of summer is unlikely to re-emerge. Defensively, his framing numbers were poor (76th out of 104 catchers), and that’s unlikely to improve to the point of being an asset – framing numbers tend to be stable from year to year. He won’t hurt the team’s winning odds, but he’s likely just a stopgap for one of the better catching prospect in baseball – Jorge Alfaro. Jorge Alfaro is seen as the catcher of the future, so what Andrew Knapp does is help to provide depth at the position. Drafted in the 2nd round of the 2013 draft by the Phillies, he’s a switch hitter with “good for a catcher” offense. Defensively he’s not all there. He needed Tommy John surgery in 2014, which causes concern regarding his ability to stay healthy while throwing out runners at second. What should we expect in 2017? It’s possible (and likely) he opens the season in Philadelphia as a back up to Rupp, given the amount of playing time he’s had at AAA. It’s also possible he ends up at AAA again, this time as the back up to Alfaro. At either level, it seems likely he’ll be a back up, unless Alfaro starts the year in the majors. The clock on Knapp’s time in the majors will be set by Alfaro. Jorge Alfaro was one of the main returns for the Cole Hamels trade in 2015. Having broken his ankle before the trade, we did not get a chance to see him play in our farm system until 2016. Play he did – at AA Reading, he hit .285/.325/.458 with 15 HR in 435 PA. He impressed enough to be called up on August 26 after the Carlos Ruiz trade. He didn’t get a single plate appearance before being sent down when A.J. Ellis arrived from Los Angeles. After rosters expanded in September, Alfaro was once again called up to the majors. He got his first plate appearance (and hit) on September 12. Despite making four starts at catcher, he would not record another hit until his final game of the season, nearly two full weeks later. Not crescent fresh. What should we expect in 2017? Given that he has seen playing time in Philadelphia already, there’s an outside chance he could start the year in the majors. However, like J.P. Crawford, he will probably start the year in AAA and finish it in the majors. His raw power has never been in question, but translating it to game power is something that time developing in the minors could help. He possesses what has been described as a “howitzer” of an arm (a visceral phrase that I love), which we can look forward to seeing at some point this year. I’ve loved the Phillies for a long time. Born in Illinois but with roots in Philadelphia, it was always the Phillies, and no other team. (Sorry, Sixers, but 90’s Dave was a Bulls fan. I mean, Michael Jordan. Can you fault me?) To reward me for my loyalty, the Phillies went all out on my birthday, and signed Ryan Hanigan to a minor league contract. Hooray. 2016 saw Hanigan record a career low everything. He had the 3rd worst offensive season out of 438 players in the majors (min. 100 PA). As they say, “you really shouldn’t have”. What should we expect in 2017? Hanigan provides a veteran presence to a young roster, which is something. If he makes the team, he will open the year as the back up to Rupp, playing the role of “a warm body” while Alfaro develops in Lehigh Valley. That does it for the infield. As spring approaches and the snow melts our memory of snow becomes a distant haze, we’ll see the roster start to shape up. Until then, let’s enjoy the baseball that we get, meaningless or not.